The glaring divide between the U.S. intelligence community and the Oval Office on the issue of Russian election meddling was never more conspicuous than at Thursday’s White House press briefing. Gathered to set the record straight—and get bombarded with questions about President Trump’s oft-contradictory statements regarding Russia—was White House National Security Advisor John Bolton, Director of National Intelligence Dan Coats, FBI Director Christopher Wray, Secretary of Homeland Security Kirstjen Nielsen, and General Paul Nakasone, head of U.S. Cyber Command. 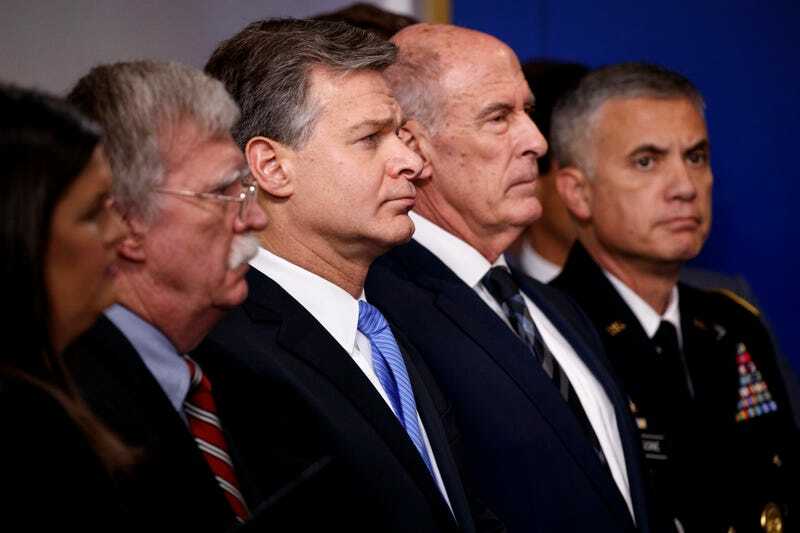 Nearly every U.S. intelligence and national security agency is involved in a massively coordinated effort to “root out” foreign influence operations aimed at the 2018 and 2020 elections, the officials said. Per Wray, operations aimed at the U.S. encompass a wide range of malicious activities: the targeting of U.S. officials and other Americans through traditional intelligence tradecraft; criminal efforts to suppress voting and provide illegal campaign contributions; cyberattacks against voting infrastructure; computer intrusions targeting election officials and others; overt and covert manipulation of the press; and the spread of disinformation on social media, which directly targets U.S. voters. We are doing everything we can to have a legitimate election that the American people can have trust in. The Pentagon, according to Nakasone, is currently providing U.S. intelligence agencies with information and leads on foreign adversaries who, he said, “are attempting to sow discord and division within the American public.” Some of these leads are coming from overseas allies. After describing at length the scope of the threat and the efforts of the government to defend against it, the officials were immediately peppered with questions from reporters about why their unified stance, which is unambiguously explicit in its condemnation of Russian aggression, frequently differs to a great extent with that of the president. Trump’s denials trace all the way back to the election itself and, in fact, precede it. The Trump campaign’s original position was, amazingly, that the Democrats leaked their own emails; a “hoax” intended to “distract from the many issues facing their deeply flawed candidate and failed party leader.” And not long after winning the election, the official position of the Trump transition team became that the Central Intelligence Agency fucks up so often, who can believe anything they say anyway? Scattered among the denials, of course, are contradictory admissions interlaced with blame pointed at anyone but Putin: It’s Obama’s fault. It’s the Democrats fault. No one knows anything. Other countries do it too. And, of course, it could be other people also. REPORTER: The special counsel, Robert Mueller, has indicted more than 20 Russian officials based on work by the FBI for meddling in the 2016 election. The President has tweeted that that investigation by the special counsel is a ‘hoax’ and should be shut down. I know you’ve said you don’t believe it is a hoax, but why would the American people believe what you’re saying about the FBI when the president says that the investigation by the special counsel is a hoax and when the press secretary yesterday said there is a lot of corruption within the FBI? DIRECTOR WRAY: Well, I can assure the American people that the men and women of the FBI, starting from the director all the way on down, are going to follow our oath and do our job. REPORTER: Do you see [Russian influence operations] directed to any particular party? Is there any particular party that is benefiting from current 2018 Russian efforts. DNI COATS: What we see is the Russians are looking for every opportunity, regardless of party, regardless of whether or not it applies to the election, to continue their pervasive efforts to undermine our fundamental values. REPORTER: The president seemed to indicate that he may believe Vladimir Putin when he said he didn’t have any influence in the 2016 election? What is your belief about the Russian government involvement in meddling in 2016? And if as you say, Russia continues to try to influence our electoral process, does that mean that nothing much came of the meeting with Putin, or is it other than government actors who are involved? DNI COATS: Well, in relationship to the 2016 election—of course none of us were in office at that particular time, but the president, vice president, i think everyone at this stage has acknowledged the fact that the [Intelligence Community Assessment] was a correct assessment of what happened in 2016. We have subsequently made a determination to make this a top priority, that it doesn’t happen again, and we’re throwing everything at it... relative to my discussions with the president, on whatever issue it is, I do not go public with that. I do not think that’s the proper thing to do. Coats ended that exchange with a comment that, depending on how you read it, may not inspire a swell of confidence in the U.S. government’s ability to safeguard the election process. What should deeply concern all Americans is the response Coats gave when asked what he knew about the Trump-Putin summit: “I’m not in a position to either understand fully or talk about what happened in Helsinki.” That is definitely a remarkable thing for the nation’s top intelligence officer to say.